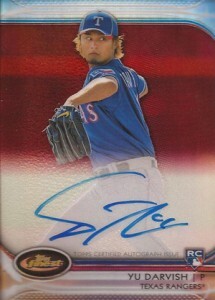 When the baseball season began, a lot of the hobby focus was on Yu Darvish. And while that hasn't let up, a lot of the attention shifted to Bryce Harper once he was called up by the Nationals. Then Mike Trout happened. 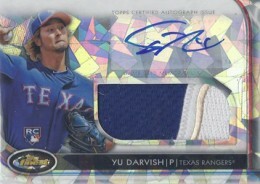 It might be a little surprising, then, that the top-selling player in 2012 Topps Finest Baseball on eBay, so far, is Yu Darvish. Of the top ten highest priced cards sold from the set on eBay since the set's release, six feature the Japanese pitcher. Harper is on three. 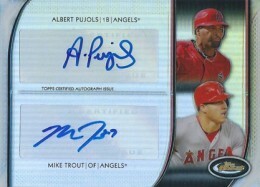 And while two Trout dual autographs appear, he's not in a lot of the set as his rookie cards came out last year. 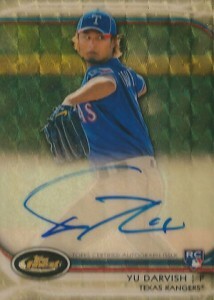 Outpacing all 2012 Topps Finest sales so far is a Yu Darvish Superfractor Autograph. The $1,825 closing price is certainly a decent price, but it probably could have been higher. The seller listed it as a Refractor and not the Superfractor, although it was confirmed in both the picture and the description. The card has the distinct Superfractor gold background and an on-card signature. Other solo Darvish cards on the list include an Autograph Jumbo Patch Printing Plate ($725), an Autograph Jumbo Patch Atomic Refractor 5/5 ($720) and a Red Refractor 11/25 ($650). By comparison, Harper appears by himself just once on the list. An Autograph Jumbo Patch Atomic Refractor 1/5 closed at $765.22. 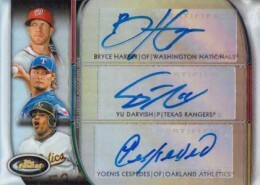 Harper and Darvish also appear on a Triple Autograph with Yoenis Cespedes. Two of the cards have sold online so far. One went for $735. The other closed at $710. There are a couple of reasons that might help explain why Darvish is outselling Harper. The first is quantity. All of the top-selling cards have low print runs. While Darvish and Harper appear on roughly the same number of cards, it might be as simple as more high-end Darvish cards have been pulled. Darvish also has a massive global following. This could lead to more people listing on eBay to reach the Japanese market. Harper cards still might be changing hands, just not as many online. 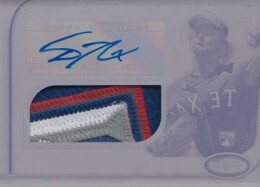 Below is a list of the top ten 2012 Topps Finest Baseball eBay sales since the set's release about three weeks ago. A dual autograph with Bryce Harper and Yu Darvish closed at $800. However, the same card has been re-listed by the same seller and is not included on the list below as it clearly did not change hands. Data based on completed eBay sales through August 26.